Will it be a fired up Hammers who face Chelsea at the London Stadium cauldron for the Monday Night match? When compiling reasons to dislike the top teams it doesn’t take long to come up with a long list for tonight’s visitors. They have few redeeming features and represent much of what is wrong with the uneven playing field that the modern game has become. An average mid-table team that were transformed to greatness by winning the Russian lottery. It does make you wonder though what might have happened had Roman Abramovic landed his helicopter at Upton Park rather than Stamford Bridge all those years ago. Would we now be pining for the days of academy players, dodgy loan deals and a bare-bones squad or would we be happy to bask smugly in the reflection of a roomful of domestic and European silverware of more recent vintage than 1980. Perhaps one day West Ham will themselves win the Arab-millions raising the dilemma of whether success trumps working class east-end traditions after all. I still think Chelsea can be caught. There are many point to play for and there are no easy games in the Premier League. If they slip up, which you can in every game, others teams need to be ready. – Slaven Bilic on there being no easy games. 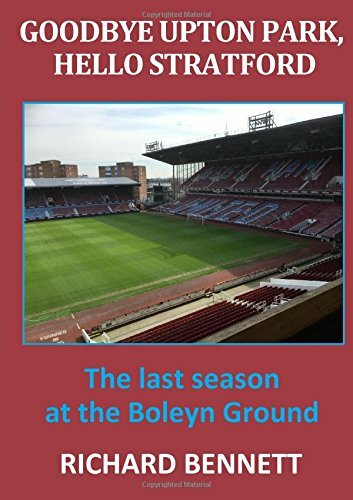 I have sensed an uneasy end-of-season feel during our last two matches as mid-table obscurity leaves little left to play for apart from a few extra million in prize money and a new contract for Slaven Bilic. Still the visit of the west London league leaders should be enough to rouse both players and supporters in delivering one of those ‘obscene’ displays of floodlit energy and enterprise. A record that was once lent slightly in our own favour has been skewed and reversed since the roubles went on deposit at Stamford Bridge. Victories for the Hammers since the turn of the century have been few and far between and in the last 12 league encounters there have been just 2 West Ham wins and two draws. Of course it would have been 3 wins had it not been for a shocking refereeing display in the away fixture at Stamford Bridge last season. Strangely our all time cup record against Chelsea is very poor and so it was doubly surprising to have seen them off in the EFL cup earlier in the season. For anyone interested I read somewhere that this will be West Ham’s 64th Monday night match fixture of the Premier League era during which time we have won 19, drawn 20 and lost 24. Michail Antonio misses the game against his apparent would-be employers through suspension and Sakho, Ogbonna, Tore and Arbeloa (remember them) are still absent through injury. Andy Carroll is listed in the media as doubtful which in historic terms means that he is out for a further 6 weeks. We must hope that on this occasion it is the exception that proves the rule as Carroll’s availability is essential if we are to give Chelsea a decent game. Elsewhere I don’t imagine Bilic will pull out any surprises and will again avoid any difficult midfield decisions by sticking with Cheikhou Kouyate at right back, making it the same starting eleven as at Watford with the exception of the enforced Carroll/ Antonio switch. We will know the other results of the other teams. (There will be) positive or negative pressure, but we are ready to play this game and to try to do better than the last game. We are preparing different solutions also to try to limit the strength of our opponent. I haven’t bothered to check the Chelsea injury situation as with plenty of full internationals to fill every position several times over and a dozen or so others out on loan it is fairly academic. No doubt Costa will score at some time but the bigger danger is that we let Eden Hazard run us ragged. Although Chelsea tend to win matches through organisation and work-rate I fear a capitulation (of Arsenal and Manchester City proportions) if we cannot find a way to stop Hazard running through from midfield. If we can raise our performance as well as our tempo then maybe, just maybe we can get something from the game, and ironically doing Tottenham a big favour. It is a long shot but if we do I will be as happy as the nearest person called Larry. Welcome 46 year old Andre Marriner from the West Midlands. This is Marriners 4th encounter with the Hammers this season having previously officiated in away games with Manchester City and Swansea and the home fixture with Stoke City. Last season he was in charge of the rousing victory against Spurs at Upton Park. In 27 games (all competitions) this term Marriner has brandished a whopping 107 Yellows and 6 Red Cards. What chances of there being 22 left on the field by the final whistle tonight?